In 1984, the United States hosted the summer Olympics in Los Angeles, California. Today in somewhat of a surprise announcement, Los Angeles agreed to host the 2028 Olympics. It is expected to cost around $5.3 billion to pull off the games in Los Angeles. So the big question we have now is, will a tiny piece of that $5.3B be used to bring back the All-American Marching Band? 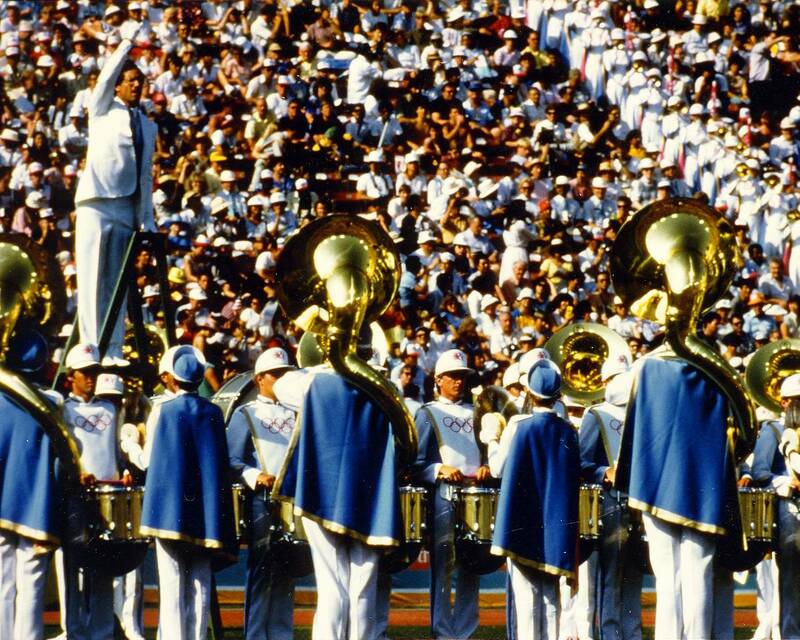 To start off the Opening Ceremonies in 1984, the Olympics Committee commissioned a marching band that consisted of 800 of the top college band marchers from across the country. It was called the Olympic All-American Marching Band. Under the direction of USC's Spirit of Troy Director, Dr. Arthur Bartner, the band pulled off one of the most amazing feats in marching band history. The band included 96 trombones and 144 trumpets. The now famous "Olympic Fanfare and Theme" written by John Williams that has become the anthem of the Olympics was actually first debuted at these games by the band. Take a watch as the massive 800 member band opens the 1984 Olympic Games and celebrates America. Later in the opening ceremony the band performed a "Swing" show that included American classics like "Take the A Train", "Sing Sing Sing", "Opus #1" and many more. Pretty much the most epic swing halftime show ever. At the end of the Olympic Games the band returned to perform for the Closing Ceremonies and once again just completely owned the ceremony with the playing of the Olympic Fanfare and Theme. So now we wait, 11 years to be exact, for what could be the resurrection of one of the great moments in Olympics history. Will the All-American Marching Band return to Los Angeles?